The Museum of Science and Industry is a large campus with many interesting elements to it. They have a very large, well cared for butterfly garden, and an indoor butterfly nursery. The garden was very active with many species of traveling butterflies stopping by for a visit. I caught one swallowtail butterfly laying an egg on a leaf, and it meant a lot to me, knowing that there would be more butterflies in the tomorrows ahead! They have a main building comprised of an IMAX theater, cafe, gift shops, auditoriums and many interactive hands on exhibits for older kids, including a whole section on the biology of life and genetics, space, physical science, and magnetism. They also had a fun section called Disasterville, which had several areas describing all about natural disasters, like fire, tornadoes, hurricanes, earthquakes and more. The exhibit had displays on electricity, lightning, the elements that contribute to fire, air circulation, and a simulated tornado. Then, there is another whole building dedicated to younger children called Kids In Charge. This was Bryan's favorite place of all, and he ran , following the star trail all the way inside. This place was fabulous. We saw many many new exhibits we have never seen before. Really interesting things, like the bones table, where the game is to put the human bone skeleton all back together. Then there was the Dinosaur head that was missing his teeth, and the game was to put all the teeth back in his jaw. There were buttons to push, levers to activate, sounds to explore, shadow walls to dance to, and more. This area was very roomy and had couches for people to sit and rest, while the kids had a blast. 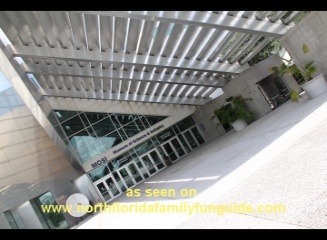 This is an amazing museum complex, one of the best I have seen in North Florida, due to it's sheer size, and variety of things for kids of all ages, and their families to participate in. I loved the butterfly garden too!